Parents at Ogden International School were asked to pitch in thousands of dollars to offset the effects of budget cuts. 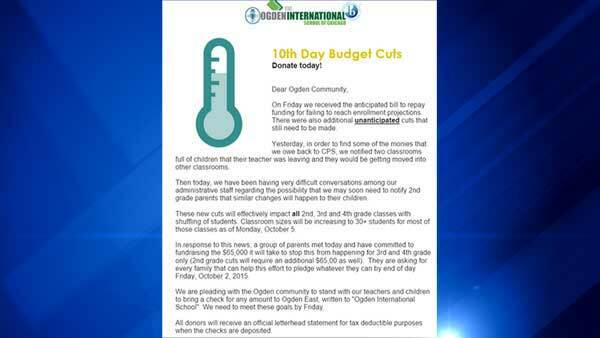 CHICAGO (WLS) -- Parents at Ogden International School were asked to pitch in thousands of dollars to offset the effects of budget cuts. The school sent a note to parents saying that the school apparently owes money to CPS because it didn't reach enrollment projections. According to the note, Ogden plans to cut two teaching positions and increase the classroom size for all 2nd, 3rd and 4th grade classes. To prevent this from happening, the school needs $130,000. A group of parents vowed to raise $65,000. Ogden asked other parents to donate whatever they can to make up the other half owed by the end of this week. On Friday we received the anticipated bill to repay funding for failing to reach enrollment projections. There were also additional unanticipated cuts that still need to be made. Yesterday, in order to find some of the monies that we owe back to CPS, we notified two classrooms full of children that their teacher was leaving and they would be getting moved into other classrooms. Then today, we have been having very difficult conversations among our administrative staff regarding the possibility that we may soon need to notify 2nd grade parents that similar changes will happen to their children. These new cuts will effectively impact all 2nd, 3rd, and 4th grade classes with shuffling of students. Classroom sizes will be increasing to 30+ students for most of those classes as of Monday, October 5. In response to this news, a group of parents met today and have committed to fundraising the $65,000 it will take to stop this from happening for 3rd and 4th grade only (2nd grade cuts will require an additional $65,00 as well). They are asking for every family that can help this effort to pledge whatever they can by the end of day Friday, October 2, 2015. We are pleading with the Ogden community to stand with our teachers and children to bring a check for any amount to Ogden East, written to "Ogden International School". We need to meet there goals by Friday. All donors will receive an official letterhead statement for tax deductible purposes when the checks are deposited."